Profit Accumulator is a leading matched betting software provider first established in 2014. It has quickly grown to become one of the leading matched betting websites in the UK, being credited as one of the first successful mainstream matched betting services. For a fixed monthly fee, members have access to a wide range of matched betting tools and services that are 100% legal and scam-free. With an intuitive interface, reasonable membership rates, quality customer support, and a host of fantastic matched betting tools; Profit Accumulator has a lot to offer anyone looking to make money from matched betting. There are a few pricing options for Profit Accumulator, with both monthly and yearly options available, not to mention a free trial for those unsure of the product. Better still, increase market competition resulted in price reductions for all membership options! Profit Accumulator’s free trial is an excellent option for anyone interested in using the matched betting service. The trial consists of two offers that are free of charge and provide up to £45 in profit and access to some of the basic features. 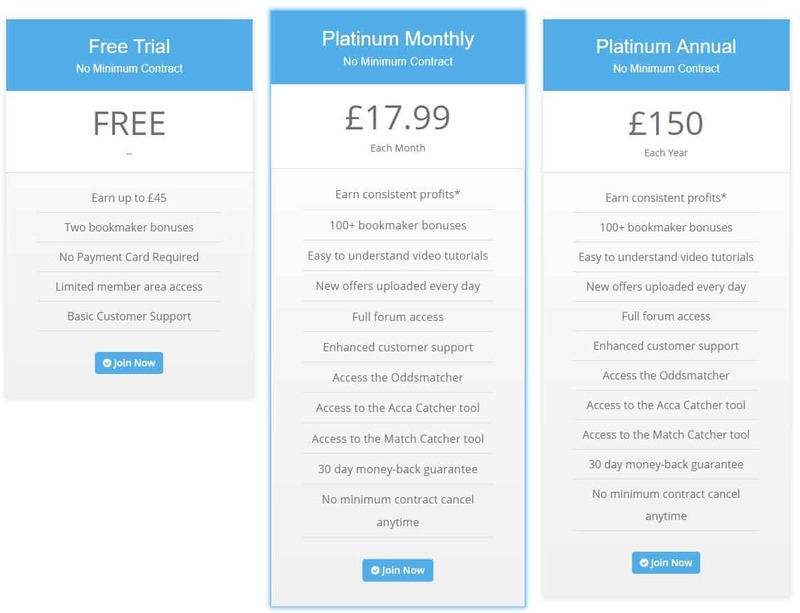 The free trial is certainly worth a go for anyone curious about Profit Accumulator or matched betting in general, as it gives you a good taste of what to expect from the website. Best of all, it guarantees a profit of up to £45, and while your profits may not be as high as this, you still have the chance to make enough cash to cover a few months membership by simply taking advantage of the free trial! To gain access to the entire Profit Accumulator service, you must sign up for a Platinum Membership. The first of these is a monthly payment option that costs £17.99 per month, and while not the cheapest matched betting membership fee, the number of tools and features you gain access to makes it a worthwhile investment. Profit Accumulator’s monthly fee was previously £22.99 along with a £15.99 monthly fee for using their tools, so this is a notable saving without any reductions in services or features, so there’s never been a better time to sign up. This membership costs a one-off annual payment of £150, offering a saving of £65 compared to using the monthly membership option. While not everyone can afford this one-off payment, those that can will make a significant saving doing so and gaining access to Profit Accumulator for an entire year is a sure-fire way to make lots of profit – it’ll end up paying for itself if used correctly! A great aspect of Profit Accumulator’s pricing is that there is no minimum contract length. You can cancel at any time without much fuss, which is especially useful for those with a monthly membership that aren’t entirely sold on the product. Make sure to cancel before the next agreed date of payment, otherwise, it will be automatically renewed and will charge you for that period. This is very important if cancelling an annual membership! Profit Accumulator has a massive range of tools and services, being one of the most comprehensive matched betting websites currently on the market. Those that are new to matched betting may initially be overwhelmed by all the options, but there is a lot to appreciate once you get more familiar with the various tools on offer. Anyone with experience in matched betting is going to love what they see. Profit Accumulator provides an incredible range of tools and services that dwarf some of their competitors, letting members make a significant profit each month. One of the first things members will notice after signing up for Profit Accumulator and visiting the homepage is the number of tutorial and instruction videos available. This is excellent for first-time users of matched betting, as the training archive is packed with helpful videos, articles, and FAQs regarding matched betting and the tools and services on offer at Profit Accumulator. Most of the training videos are designed with beginners in mind, providing quick and easy instructions on all aspects of matched betting. Tutorials take you through the entire process, including signing up, choosing a bet, best odds to opt for, how to claim free bets, what to place bets on, and plenty more. Many come with step-by-step instructions, so you can’t put a foot wrong, so getting started on Profit Accumulator couldn’t be easier, even for those new to matched betting. Also, new tutorials are constantly released to match the new offers that go live daily, so you should never struggle to understand how to use Profit Accumulator and what deals are on offer for each day. The odds matcher tool on Profit Accumulator is one of the most used, sourcing bets for users when they sign up for offers and free bets. This tool currently matches with 48 bookmakers across the country, finding all the latest free bets and lay odds on countless betting different markets. 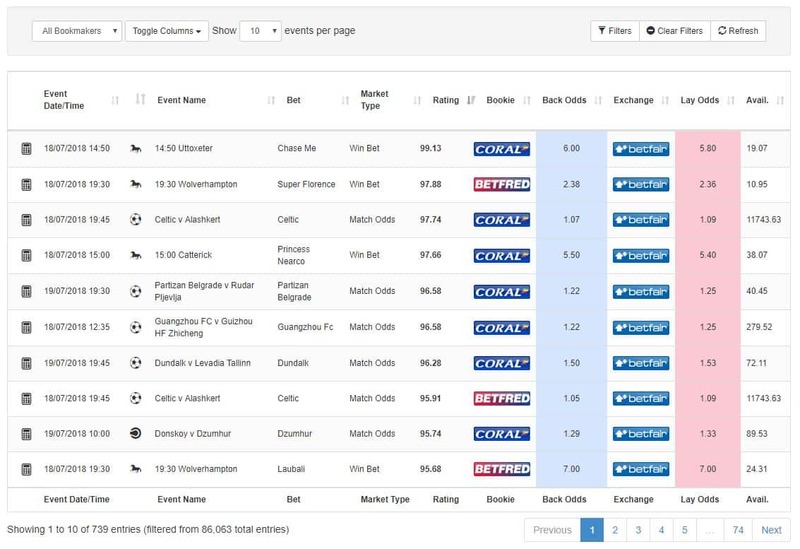 Profit Accumulator have developed their own software for this tool, and it works very well, matching odds on dozens of bookmaker sites and covering a variety of sports, including football, horse racing, rugby, tennis, basketball, baseball, and American football. This takes the hassle from searching every bookmaker site manually for the latest free bets, which is the cornerstone of any matched betting service. The software searches for back and lay odds that are closely matched, minimising risks and maximising profits. Simply search for a bookmaker and the desired odd (recommendations are found in each guide), then let the odds matcher select an appropriate bet. 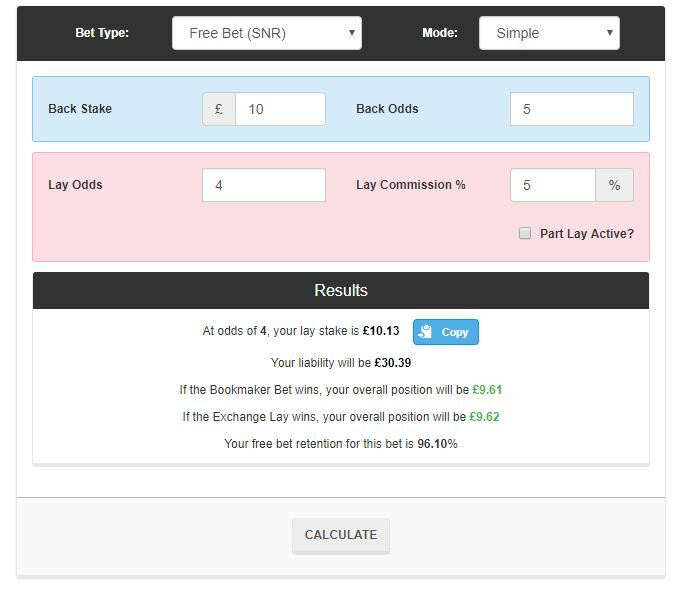 Every result on the odds matcher provides a link to an integrated matched betting calculator, which shows the back and lay bets to place, including options for stake not-returned and stake-returned free bets. You can filter the options in the odds matcher, letting you combine searches based on bookmarker, sport, betting markets etc. There is also an option to search for keywords, which is useful for finding bets for specific competitions such as the Premier League. Profit Accumulator offers a standard matched betting calculator along with a series of advanced calculator options. The matched betting calculator is simple enough to use, giving a clear indication of the bet amount needed on each outcome to guarantee a profit. All you need to do is enter the odds of the bookmaker and betting exchange, enter a stake or free bet, after which you are told precisely the amount to place on a lay off to make a profit. Other advanced calculators are available for specific betting too. For instance, there are four calculators for making spread betting while the ‘refund it’ calculator indicates the amount of profit possible from money back guarantee offers. A simple yet effective tool, profit tracking displays total profits made since using Profit Accumulator, providing users with a much more intuitive tool to track their profits rather than a basic spreadsheet. Spreadsheets are great for tracking profits but often require experience using them and matched betting, so this tool is excellent for beginners and advanced users alike. It’s quick and easy to use, providing helpful information regarding profits, placed bets, and other notes on your actions. This tool is designed specifically for horse racing and is actually more impressive than their standard odds matcher tool. This is because the updates are more frequent and in real time, providing better accuracy on offers for horse racing. It’s a great tool for those looking to bet on horses, giving special odds that are only available on horse races, which is why it isn’t found in the main odds matcher section. All offers are preconfigured for horse races, giving a clear indication of the stake cost without even needing a calculator. Take advantage of this tool during weekends and significant horse racing events like the Grand National and Cheltenham Festival, as there are fantastic deals and bets available during these periods, all of which quickly appear on the match catcher tool. The Acca Catcher tool aims to increase your profits by giving taking advantage of accumulator insurance deals. With thousands of pre-made accumulators using integrated calculators, you get a clear indication of the lay bet to make, while they can be saved so you can work out the next lay bet to place on the accumulator. You then choose the type of betting option to place – regular or lay all. Regular is basically a standard qualifying bet that ensures profit from the free bet is locked in, while the lay all option lets you set everything at the start, saving the hassle of monitoring the progress. These accumulator offers are common in matched betting but are often viewed as being only for experienced users, but the Acca Catcher is very user-friendly so should be easy enough to grasp – make the most of the tutorial videos and the forum section for how to best the software! On Profit Accumulator’s homepage, there is an option to click the offers tab, which provides a list of different offers, including signup, casino, bingo, and reload offers. A common misconception regarding matched betting is that once you have made all sign-up offers, the process is useless. This couldn’t be further from the truth, as those with accounts on any bookmaker website can use reload offers to continue to make profits each month. These are basically where all the real profits are made from matched betting, as those in it for the long-haul make the most money using reload offers. After all, a sign-up bonus can only be used one time! All the reload offers are shown on the offers page under the reload offers tab. There are videos providing instructions and simple articles explaining everything you need to know about reload offers and how to use them. Once ready, visit the platinum forum for up-to-date reload offers, where you can find the weeks main reload offers from each bookmaker. 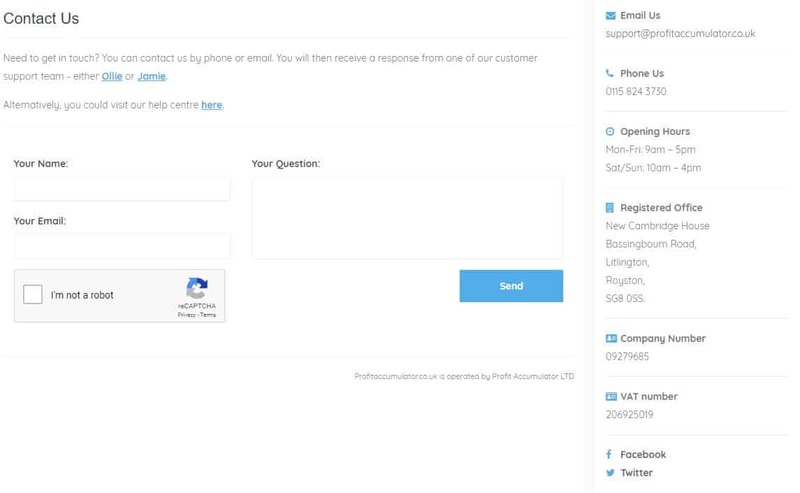 Profit Accumulator provides standard customer support services that includes telephone support, email support, and support tickets. They operate standard hours for support services, from 9 am to 5 pm on weekdays and 10 am to 4 pm on weekends. Support staff are amicable and knowledgeable of all aspects of matched betting on Profit Accumulator, so should be able to help with any problems you might be having. Another fantastic support tool is the forum sections of the website. This is a massive resource with all the latest information and updates regarding the website, and the thriving community is packed full of helpful advice for anyone dealing with problems. For instance, heading to the matched betting forum is a great way to learn more about this tool. There are countless experienced matched bettors offering tips, hints, and advice, with experienced moderators and Profit Accumulator staff regularly posting throughout. Better still, the forums are often the place to go to find missed deals and odds on almost any market, so it’s certainly one of the more useful types of support available on the website. Plus, everyone is very friendly and willing to help, with a strong sense of community where users will share jokes, betting stories, and have a general chit chat regarding matched betting and Profit Accumulator. Anyone willing to promote Profit Accumulator could make themselves a good bit of cash using the company’s affiliate program. Basically, if you promote the website on various social media and blogging platforms using the program, you could gain 50% of any profits made from customers that sign up throughout your affiliate program. With more than £1.5 million paid out in affiliate commissions, the sky is the limit for anyone that is passionate about the Profit Accumulator and willing to promote to others using digital marketing techniques. Sadly, there is no mobile app for Profit Accumulator, but their website is fully optimised for mobile use, allowing you to make bets and check progress straight from a handheld device. You can place banners on your website or social media channels and use tracking links to determine the success of your affiliate program, helping to gain more profits from anyone you convince to sign up for a platinum membership. Profit Accumulator remains at the forefront of matched betting, and their website makes it easy to see why. There is a wide range of tools on offer, all of which become easier to use thanks to the in-depth guides and tutorials, making it easier to get the desired profits from matched betting. While a lot of these tools are quite advanced for beginner’s, the ability to seek out helpful advice on the website forum makes them easier and generally more enjoyable to learn. Speaking of the forum, this one of the main selling points of the website, providing a wealth of resources and a friendly community for users to enjoy. You’ll find all manner of useful tips and tricks for making as much profits as possible, while the friendly nature makes it very welcoming to novice match bettors. The company’s experience in matched betting has led to them using some of the best software available, resulting in a massive range of deals that give plenty of opportunities to make a good profit. That said, some features, such as the odds matcher, lack the same level of accuracy as certain competitors, while the advanced features are often off-putting for new users. However, as you become familiar with the more advanced features on the website, they become more appealing, giving additional avenues to make profits. Prices may be viewed as expensive to some, but the reduced fees have certainly improved this aspect, and it’s more than possible to cover the monthly costs using the tools available. In fact, it’s possible to make £1,000 each month with regular matched betting on the website, while affiliate programs could increase this amount even further. You need to dedicate enough time to achieve these goals, however, although it is certainly possible with Profit Accumulator. Pingback: Yesbets Review 2019 | You Must Check Out This Before You Sign Up!